Mehmet Özhaseki underscored that even though Ankara was home to various civilizations and has numerous monuments from the Roman, Seljuk and early Turkish Republic periods, it does not receive a high enough share of the country’s tourism. The Justice and Development Party's (AK Party) candidate for the Ankara Metropolitan Municipality, Mehmet Özhaseki, stressed that if he is elected his priority will be providing services to people without exception and taking Ankara to a higher level with projects in all fields. "The capital, Ankara needs to be a prominent city in all fields; yet, it lags behind in competition between the capitals in the world in the field of tourism despite its rich history and monuments," Özhaseki said in an interview with Daily Sabah and added that the project Culture Road should be implemented immediately. Özhaseki underscored that even though Ankara was home to various civilizations and has numerous monuments from the Roman, Seljuk and early Turkish Republic periods, it does not receive a high share of the country's tourism. With the aim of boosting tourism in Ankara, Özhaseki said they will set up the Culture Road project, which will have one short and one long route. Accordingly, the 8-kilometer short route will start from Ankara Castle and end at the July 15 Martyrs Monument. This road will pass by 382 monuments. The 12-kilometer route will start from Ankara Castle's Akkale bastion, which was the first settlement in Ankara, and end at Atakule. The road will pass along 411 monuments in total. Özhaseki stressed while there are 72 museums in Ankara, the number of people visiting them is low. One of the projects of Özhaseki hopes to organize if elected is Museum Days. There will be days museum entrance will be free and other services such as transportation or guided tours will be covered by the municipality. Planning 111 projects under 11 titles, Özhaseki highlighted that "with my team we prepared a booklet about our projects; it is a commitment." In the upcoming local elections slated for March 31, the Nationalist Movement Party (MHP), which formed the People's Alliance with the AK Party, will support candidates from the AK Party in Ankara, Istanbul and İzmir instead of nominating their own. "The votes of the AK Party and the MHP will be enough to easily win the election; yet, my aim is to gain votes from the supporters of other parties," and stressed that with his team they have worked on numerous projects that will appeal to voters from other parties as well. Referring to his post as Kayseri mayor, he underlined that "the people elected me five times because of this." 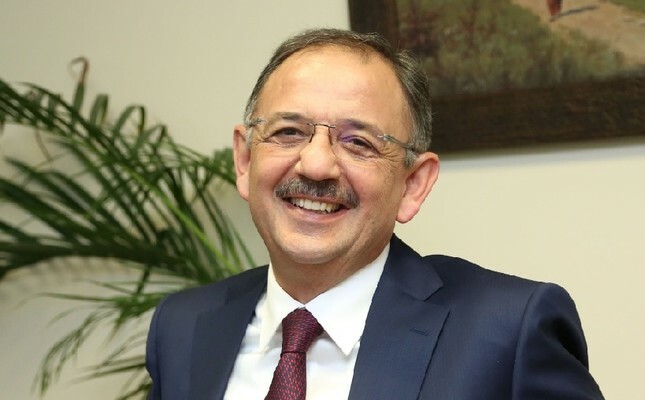 Özhaseki is a former environment and urban planning minister who now serves as a deputy from central Kayseri province and is also the AK Party vice chairman in charge of local administrations. He held the Kayseri mayor's office for more than 20 years and is experienced in urban development and management. One of the common complaints of people living in Ankara is that there are not enough green spaces for people to spend time in or relax. "In Ankara people go to shopping malls and come back to their homes after having lunch on the weekends. We will change the way the people of Ankara spend their weekends," Özhaseki said. He added that: "We determined 13 places where People's Gardens can be built. In three places, the ministry has already started working [on them] and in the remaining 10 places, the municipality will build the gardens." Özhaseki stressed that total green area per person, which is currently 19 square meters, will increase to 27 square meters with the People's Gardens. The People's Gardens will be designed to hold exhibits, concerts and conferences. In these areas, people will be able to relax, do sports, have lunch and spend time in reading houses modeled on traditional Turkish coffee houses. Özhaseki said he thinks many people will enjoy the parks. In relation to projects for students, Özhaseki said the number of libraries open 24 hours will be increased. "We have determined 10 places for these libraries. In a decent environment, the students will be able to study as long as they want," Özhaseki said and added that there will be snacks available as well. Underlining that one of the biggest problems for students is laundry, Özhaseki said that there will be places where students can take advantage of laundry services. Touching on another project, Özhaseki said that there will be buffets where students can get soup or tea in the morning. Özhaseki also announced that the bus fares for students will be decreased, with the aim of supporting them. Aside from meeting the basic needs of students, Özhaseki said that services will be introduced that help young people be more involved in sports. In Ankara, over 90,000 stray animals live on the streets and to help take care of these animals, four medical and rehabilitation centers will be established in four regions. If the stray animals have diseases, they will get treatment, and the older ones will be looked after permanently in these centers. Özhaseki said this is one of the main issues that needs to be addressed. He pointed out that the animals should not be kept in shelters, which are like prisons. He stressed that in the new centers, the animals will receive care and slowly be released back into their neighborhoods.